Biscottificio Innocenti Before the Trastevere neighborhood became Rome’s nightlife mecca, its warehouse-like spaces produced household essentials. One rare holdover is 100-year-old Biscottificio, where ladies in white caps mix flour, sugar and a few other ingredients into over 50 kinds of biscotti. The choices range from elegant chocolate-dipped butter cookies to brutti ma buoni ("ugly but good”), lumpy mounds of nuts in a chewy meringue. Via della Luce 21; 011-39-06-580-3926. ‘Gusto 28 Alessandra Marino made a name for herself in Rome with the well-regarded ‘Gusto restaurant complex. Now she’s opened ‘Gusto 28 on the same piazza. The brand-new spot is reminiscent of a 1920s cruise ship, which ties in nicely with the seafood menu (monkfish in spicy tomato broth is a standout). This is also one of the city’s few good places for vegetarians, with dishes like black rice with wasabi vinaigrette. Piazza Augusto Imperatore 28; 011-39-06-6813-4221. L‘Acino Brillo At this exciting new restaurant, green resin floors and counters are studded with cartoonlike bubbles, lamps are bright orange and tables and chairs are made of Plexiglas. Chef Stefano Preli, 26, excels at cucina creativa, stuffing ravioli with beef tongue and pumpkin instead of the standard ricotta and baking lamb in a Sicilian pistachio crust. Piazza S. Eurosia 2; 011-39-06-513-7145. Ristorante Babette Located at the end of a lovely street off the Spanish Steps, Babette has a charming, canvas umbrella–shaded courtyard. At lunch there’s a $16 buffet, and the place gets packed. The dinner menu includes surprisingly un-Roman soups, like Ligurian-style minestrone with pesto, and satisfying pastas like a carbonara with strips of zucchini and carrot. Via Margutta 1d/3; 011-39-06-3211-559. Portrait Suites After launching their boutique hotel in Florence, the Ferragamos opened Portrait Suites right above their shoe shop on Via Condotti. The hotel has no real lobby, so it’s easy to think this a luxurious private home with spacious rooms and extra-big closets (a plus, since it’s right near some of Rome’s best shopping). The rooftop terrace is open only to guests for aperitivi and breakfasts of fresh fruit and Roman pastries. Doubles from $490; Via Bocca di Leone 23; 011-39-055-2726-4000. 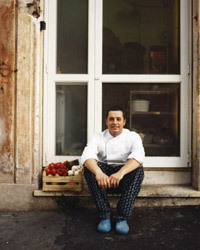 Le Colline Ciociare About 45 minutes south of Rome and just off the A1 autostrada is this 20-year-old restaurant from chef Salvatore Tassa. His menu includes weird-sounding dishes that are invariably delicious, like veal head with lemon gelatin. Via Prenestina 27, Acuto; 011-39-077-556-049.